Listening to Online..... Without a Computer! Internet Radios are here! If you have broadband you can listen to Seahaven FM online without your PC switched on. Internet radios are almost as easy to use as a normal radio. However, unlike the normal FM radio you choose your radio station by "Location" or by "Genre" (or a combination of the two). To listen to Seahaven FM you can scroll through the list by selecting >>>Location>>>Europe >>>UK >>> Seahaven FM. That's all there is to it! Seahaven FM can also be found under the Genre "Variety"
Please remember you need to have broadband to use these radios. Here are two of the radios you can buy, there are some from about £35.00 (not shown), but the two shown here are around £150.00. 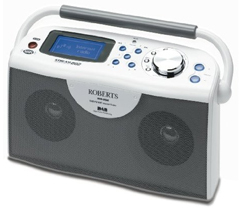 Roberts Radio Available at most stockists of radios and electrical equipment. Listen to Previously Broadcast Material from the BBC using "Listen Again". This radio can use a Wired or Wireless Connection to connect it to the Internet through your broadband. This is one of the first in a new generation of radio receivers, with Internet WiFi which will allow you to listen to Internet radio stations without your computer being switched on and can also receive DAB and FM stations. It is very easy to use and by combining access to Internet or Web-Radio, DAB and FM, it gives you an incredible choice of stations from around the world (and of course, and more importantly, Seahaven FM!